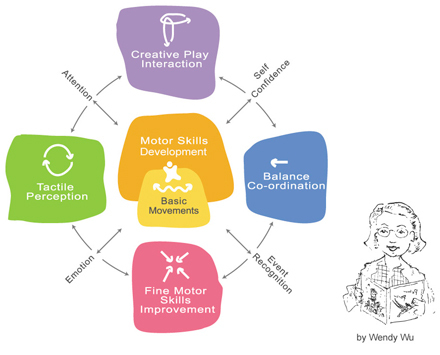 We here at Weplay develop our systematic products according to children's holistic needs, ranging over visual-auditory-tactile perception, motor skills, balance coordination, fine motor skills, and creative play. Made in Taiwan based on Universal Design, Weplay products help children grow up happily and healthily. Our design concepts is to bring cultural and natural elements into Weplay products, and therefore children can enjoy outdoor ambiance indoor. A limited place becomes unlimited space when children are having fun with Weplay range. Either for institutional or household uses, Weplay enriches children's situational activities and creative thinking. With excellent quality, multi-functions and high play value, Weplay belongs to worldwide children. Let's experience Weplay uniqueness altogether !